Toad is an intricately detailed vinyl figure. 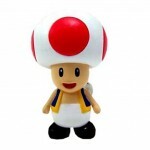 Toad is a fun-loving anthropomorphic mushroom with an overall shape approximate to a penguin or a salt shaker. Toad is among a breed indigenous to the Mushroom Kingdom, often found to be retainers of Princess Toadstool. In Super Mario Bros. 2, Toad was in fact a playable character, extremely useful in terms of speed and power, but decidedly underwhelming in jumping capacity. To view the complete set click the Title Bar.